Play once again went smoothly with no errors or problems to report. Myara was dispersed once, but that was down to some solo adventuring in a dangerous environment. ;) As followers of the adventure wwill know, the heroes managed to gain entrance to the lich's dungeons last week, and this week saw them enter some deeper chambers. They also learned of the lich's phylacteries and to keep an eye open to destroy any they should find. As a side bit of news, my boxed set of 4th edition D&D books turned up today. I have had a quick look at them and noticed some changes in particular, like the ways spells and powers are now allocated. I am not sure if I like everything that has been done, but as I only ordered them as a source of inspiration for some ideas for myslef, I won't worry about that. And for those interested, D&D Insider looks interesting and while currently unavailable, does offer some things free for the time being. Let's hope it all goes that way. I have also managed to get my scrolls working (artwork by Quillmaster) and may add an extra post about them at a later date. Now that they are ready, I can start to add some more details to the next chapter of the campaign. Books and scrolls will play a fair part in the future, and is why I wanted a good GUI interface to play them with fun. I have a few ideas already, but at the moment, they remain simply as ideas until I have the time and energy to put them into something more solid. Hopefully soon. 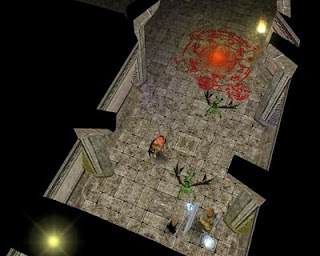 "Upon entering the eastern chambers, the heroes were confronted with a rune circle etched into the tiles on the floor. It immediately raised all their suspicions, especially Karasten who warned everybody that they may be in for an imminent attack. And sure enough, the moment Myara first entered the circle, imps were summoned to attack the intruding heroes." Read the full synopsis here.